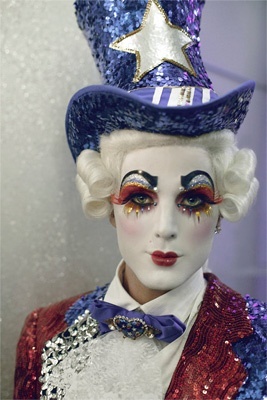 Prince Poppycock, an operatic dandy and star of NBC’s “America’s Got Talent,” will be crowned “Honorary Mayor” of the West Hollywood Halloween Carnaval. The Coronation of the Honorary Mayor will begin at 10:25 p.m. on Halloween night, on the “Rocky Horror Picture” stage located at the intersection of Santa Monica Boulevard and San Vicente Boulevard. The honorary title of “Honorary Mayor” is a highlight at the West Hollywood Halloween Carnaval, with the coronation taking place in front of more than 250,000 anticipated revelers this year. The stage will be just one part of the massive Halloween celebration underway that night. From 6 p.m. to 11 p.m., Santa Monica Boulevard will be closed between La Cienega Boulevard and Doheny Drive. Witty and glamorous, with a powerful trained voice, Prince Poppycock has opened for bands like the Dresden Dolls and The Sounds; performed at extravagant events like NYC’s Dances of Vice; and opened for performance art legend Ann Magnuson at LA’s prestigious Redcat Theater. In summer 2010, Prince Poppycock was a contestant on NBC’s “America’s Got Talent” where he became one of the top four finalists. Described by pop culture and style journalist Rose Apodaca as a “rock star in Rococo France,” Prince Poppycock’s glittering reign began in 2006 when singer-songwriter John Quale was invited to perform the Figaro aria “Largo al Factotum,” at a friend’s club. However, there was one stipulation – he must wear a wig. John appeared in a towering powdered confection to accompany the song about a fabulous hairdresser, and Prince Poppycock’s royal presence was instantly in demand.